Believing In Yourself Starts Early! Little Tigers martial arts are a fun, new activity for your 4 or 5 year old child. 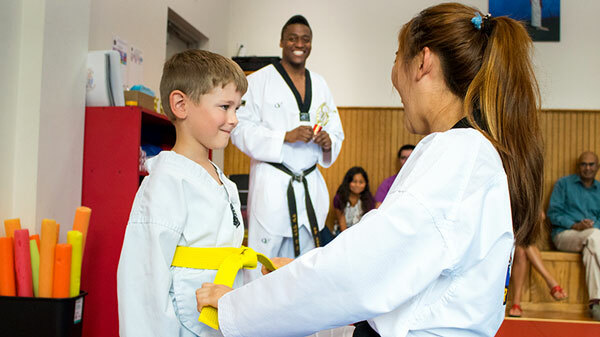 Our Little Tiger classes are taught in 30-minute sessions and use tae kwon do techniques to develop balance, coordination, and gross motor skills. Little Tigers run, jump, kick, and have a great time all while improving focus and discipline. Classes are also designed to help Little Tigers develop social skills as they practice in a group, cooperate with a partner, and learn to focus on a teacher and follow verbal directions. Little Tiger classes will help to prepare your child for greater success at home, school, and in other team sports. Classes are safe, high energy, and upbeat! Our Little Tiger instructors are friendly, encouraging, and have lots of experience with children. We use a low student-to-teacher ratio to ensure individual attention with learning both fundamental skills and social skills. Our philosophy is to help children develop self-confidence through encouragement and praise, while motivating them to try new activities. Each technique is taught in a step-by-step manner in a language that younger children can understand. We use a variety of different drills, training tools, and teaching methods to keep classes varied and fun. We offer a flexible class schedule with afternoon, early evening, and Saturday morning classes. To boost your child’s skills, register for our TRIAL PROGRAM which includes 3 FREE classes (2 private sessions, 1 group class) and a FREE uniform. This place is phenomenal! We started our five-year old son here in August and from day one, it has felt like family. The instructors are so amazing with the children and adults as well. The thing We love most about Tiger Kim’s is the way the instructors teach the children lessons that go outside of this amazing place. They teach them respect for parents, teachers, the classroom, the home, and all other public settings. The manners and excellence they teach the children and how they expect nothing but the best out of every single student is nothing short of impressive and amazing. What's the Difference between Tae Kwon Do and Karate?